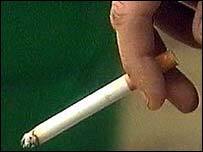 Smokers significantly underestimate the risks their habit poses to their health, a study suggests. A US survey of more than 6,300 people found current smokers underestimated their risk of lung cancer, compared with non-smokers. The research, in Tobacco Control, also found smokers thought their personal risk was lower than other smokers. A second study in the journal found most public places in European cities had high levels of second-hand smoke. Exposure varied, but it was found that someone dancing for four hours in a nightclub in a city such as Vienna or Barcelona was likely to be exposed to as much second-hand smoke as someone living with a smoker for a month. The study looked at levels of second-hand smoke in bars, discos, schools, universities, hospitals and airport and train station waiting rooms in Paris (France), Athens (Greece), Florence (Italy), Oporto (Portugal) and Orebro (Sweden). The research, carried out by a team from the Public Health Agency in Barcelona, found tobacco smoke was present in most public places. In no-smoking areas, nicotine concentrations were found to be lower, but not zero, which the researchers said showed that having separate smoking and non-smoking areas was not completely effective. Schools, where smoking was only permitted in staff rooms, tended to have the lowest nicotine concentrations, along with hospitals. In its public health White Paper, published in November last year, the UK government said smoking should be banned in most enclosed public places by 2008. The US survey of attitudes towards health surveyed 1,245 current smokers, former smokers and people who had never smoked. It found half of the current smokers questioned believed exercise undid most of the harmful effects of smoking, compared to a third of former smokers. Slightly more current smokers than former (35% compared to 31%) believed lung cancer depended more on genes than anything else. Writing in Tobacco Control, the researchers from Rutgers University in New Brunswick, New Jersey, said: "The present survey provides clear evidence that smokers engage in risk minimisation by convincing themselves that they are not as much at risk as other smokers." They add: "Given the accumulated evidence, the argument that people begin to smoke or continue to smoke with adequate knowledge of the potential risks appears indefensible." Amanda Sandford, Research Manager at the UK based Action on Smoking and Health said: "Despite the overwhelming evidence of the harm caused by smoking, it is a sad fact that smokers have a blinkered view of the health implications of their habit. "The study totally refutes the tobacco industry argument that people smoke through informed choice." She added that the research looking at smoking in public places reinforced previous findings. "Passive smoke is dangerous. Smoking should not be allowed in workplaces and enclosed public places. It really is as simple as that."